In the past, dental implants were considered to be a solution that was only in reach of a particularly wealthy minority of patients. However, over the last few decades, they have proven to be a durable and long-lasting solution, and this way an increasing number of people have realized that this makes dental implants a smart and valuable investment in the function and appearance of our teeth. The great thing is that, as well as being a sound investment that could dramatically reduce your regular dental bills, dental implants are now more affordable than ever before. There are also new and more flexible ways to meet the cost. Before signing on the dotted line for any dental implant procedure, you should always compare quotes from different dental implant surgeons, while also taking into account the dentist’s experience and credentials. This will help you to assess any differences between the services that they provide and establish which offers the best value for money. Remember – if it seems too good to be true, it probably is! It is important to remember that not all dental implant providers were created equal. Any qualified dentist can technically offer an implant service, but this doesn’t mean that they necessarily have the training, skill and experience to be able to provide them safely and successfully. A well committed and competent dental implant surgeon will have undertaken additional education and training in order to provide exemplary quality and patient care. They may be board-certified which means they will have had to prove that that they can reach exceptional standards of competency. A good implant provider will perform as many as a hundred or more implant procedures every year, the higher this number the better. And they will have the tools and equipment necessary to make safety and precision their priority. This additional expertise often comes at a price, and a reputable and experienced dental implant provider may be more expensive than someone who focuses on low cost and is highly likely to use lower-quality implants and technology. Most patients understand that the cheapest and the best are never the same thing, and when it comes to dental implants, it is far more important to choose the best surgeon that you can afford. Every dental implant case is unique, and this means that it is important to attend a consultation with your prospective implant provider to check your candidacy and obtain an accurate price based on your personal circumstances. 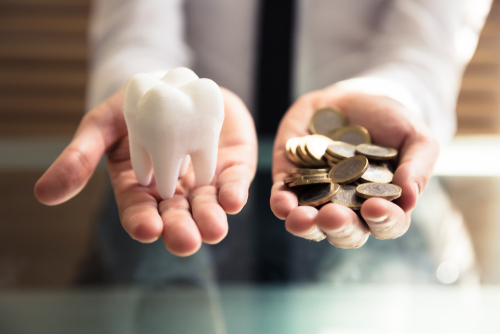 The exact overall cost may be influenced by other dental work that you need, such as an extraction, cavity fillings or treatments for periodontal disease, which should all be undertaken before you begin a dental implant procedure. Generally speaking, the cost of a completed dental implant in the United States could range from $3,000 to $6,000 depending on the experience of your dental implant surgeon. At Haws Family Dentistry in Brigham City, UT, we would be delighted to provide you a quote for your dental implants. Our cosmetic dentist, Dr. Jayson C. Haws, has extensive experience in delivering outstanding dental work, including dental implants, to patients in and around the area. To arrange your no-obligation consultation, please contact our friendly and helpful team today at 435-919-5100.